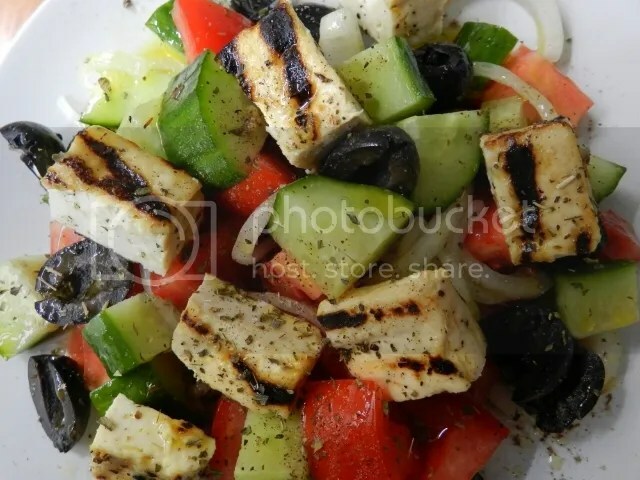 Greek salad is one of my favourite light dishes. It’s simplicity, of course, is dependent on great quality ingredients and one of the benefits of making it yourself is that you can make sure they are up to standard. Alongside the vegetable and olives, is the feta cheese, it’s salty creaminess offset the sweetness of the tomatoes and the crunch of the cucumber. Of course, if you’re keeping away from dairy you have to find a substitute. I thought of tofu, marinaded and then griddled to take the place of the feta and it has worked well beyond my expectations. It is, I think, down to the amount of salt I use in the marinade. 1/2 tsp is a lot, but most of it stays in the marinade and feta is salty. As ever with marinades, the more time you can leave your ingredients in them, the better. For this dish I’d leave it at least a couple of hours, so if you’re making it for lunch, I’d start things straight after breakfast. Don’t try and pretty this salad up. It should be made by Greek grandmothers, cutting the vegetables straight into the dish without benefit of chopping boards, so keep things chunky. Slice the tofu in half, widthways and put in a sealable plastic bag. Mix the marinade ingredients together and pour over the tofu in the bag. Seal or tie the bag and leave in a cool place to marinade for a couple of hours. About half an hour before you want to prepare the salad, put the onion slices in a small bowl and pour over a splash of vinegar, set aside. This will soften the flavour of the raw onion. When you’re ready to prepare the salad, put a griddle or frying pan on high heat and leave to get hot. Chop the tomatoes and cucumber into bite-sized chunks. Put in a serving bowl and scatter over the olives and drained onion slices. When the griddle is hot, take the tofu out of the marinade and put on the griddle to sear. Turn the heat down to medium and cook for five minutes or so, turning the tofu over so that it colours on both sides. When cooked, remove from the pan and cut into chunks. Scatter the tofu on the salad. Drizzle over some olive oil and sprinkle a pinch of dried oregano. I love spring rolls, but they’re not the healthiest of options as they’re deep fried. 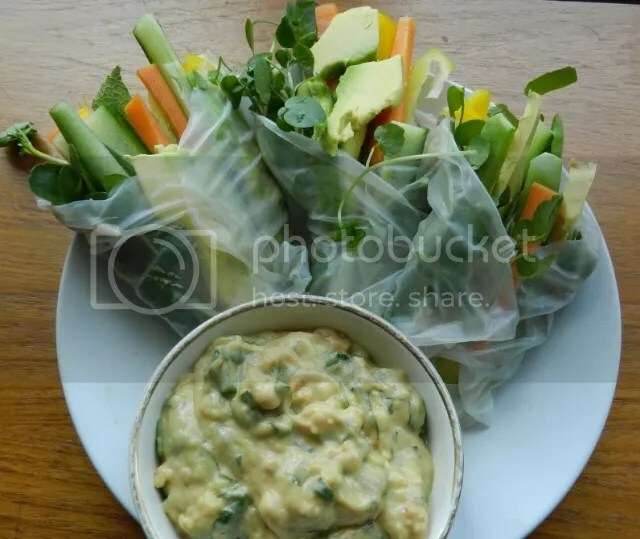 Summer rolls, hold no such worries and, with a supply of rice paper wrappers (available at bigger supermarkets) are easy to make at home. Actually, making them at home makes you realise how mean the filling has to be if you want the rolls to close properly. And you have to have pretty good origami skills to make them. This has tended to put me off making them. Then I found a picture of summer rolls that were open at one end. They looked a lot easier to make (just as sushi hand rolls take a lot of the terror out of making sushi at home) and were just so fresh and vibrant that I had to give them a go. The fillings for the rolls are what I had in the fridge at the time, so use the recipe as a guideline rather than a fixed standard. If you didn’t have mango for the dipping sauce, a ripe peach or nectarine would do just as well. If you don’t want to make rolls, the sauce would be great with a plate of crudités. Put all the dipping sauce ingredients in a bowl and mix thoroughly. Half-fill a wide bowl or deep plate with hand-hot water. Dip a rice paper wrapper in the water and hold for a few seconds until it starts to go a little flexible. Remove the wrapper from the water and put on a clean surface. Place a few of each of the vegetables in the centre. Fold over three sides of the wrapper leaving one side open. Repeat for each of the other wrappers. Serve alongside the dipping sauce. This is a gem of an idea, I only wish I’d thought of it, but the honours must go to Hugh Fearnley-Whittingstall and the River Cottage Veg Every Day recipe book. It’s a great lunch to take to work because you can prepare it the night before and it only needs boiling water to cook it. There isn’t a work place in the country that doesn’t have a kettle! You can use any thin noodle, but the instant noodles (which are the cheapest as well) cook the quickest, which is important as you have soft green leaves that wilt very quickly. I think the secret to the success is how you make your layers, the flavour goes at the bottom, followed by the noodles and then the crunchy vegetables with the green leaves on top. You also need a sealable pot or mug about 500ml in size. I couldn’t believe how well this worked, and it cost pennies to make versus the £5+ I’ve spent on something similar from a food outlet near my office. Add the bouillon powder, soy sauce, chilli sauce, lemon, ginger and chilli to the bottom of your container. Break the noodles into pieces so that they fit the container and put them on top of your stock base. Add the tofu and then the vegetables, leaving the lettuce and coriander until last. 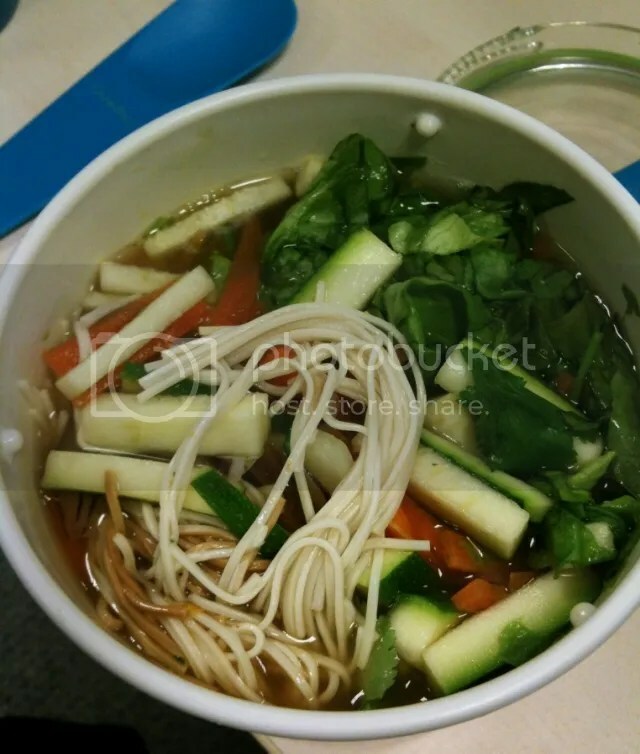 When you are ready to eat, pour boiling water into the container until the noodles are covered. Put the lid back on and leave to stand for 5 minutes. Remove the lid and stir thoroughly before eating. 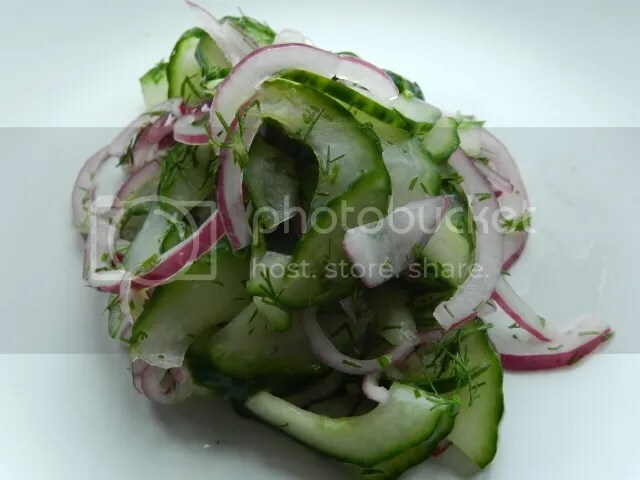 Cucumber frequently gets paired with mint, which highlights its coolness, but here the sweet fragrance of dill brings out the sweetness of a ripe cucumber. You frequently see this salad with the cucumber peeled. I think that misses the point of the green skin mixed with the pinkness of the red onion. Halve the cucumber lengthwise and scoop out the seeds with a spoon and discard them. Slice the cucumber as finely as you can. Put the cucumber in a bowl with the other ingredients. Mix thoroughly and set aside for at least half an hour at room temperature before serving.